Ukrainian Prosecutor General Yuriy Lutsenko said investigators are operating under a theory that saboteurs may have used a detonator to trigger a massive explosion and fire at a munitions depot in central Ukraine this week, according to RFE/RL. Lutsenko told Inter TV that although he believes negligence by Ukrainian security forces guarding the depot in Kalynivka may have contributed to the incident there, "we are inclined to presume that all recent blasts are part of the Russian Federation's warfare," RFE/RL reports. Investigators do not believe, however, that a drone was involved in setting off the explosions in Kalynivka in the Vinnytsya region, Lutsenko told Inter. Read alsoPoltorak: Less than US$1 mln allocated for Kalynivka ammo depot in 2017"We have no proof that it was an unmanned aerial device in Kalynivka, but we have all the facts of a possibly planted detonator, which likely caused the explosion," he said. Lutsenko said Ukraine earlier this year detected a drone that investigators believe set off a massive explosion and fire on March 23 at a munitions depot on an army base in Balakliya, near Kharkiv. 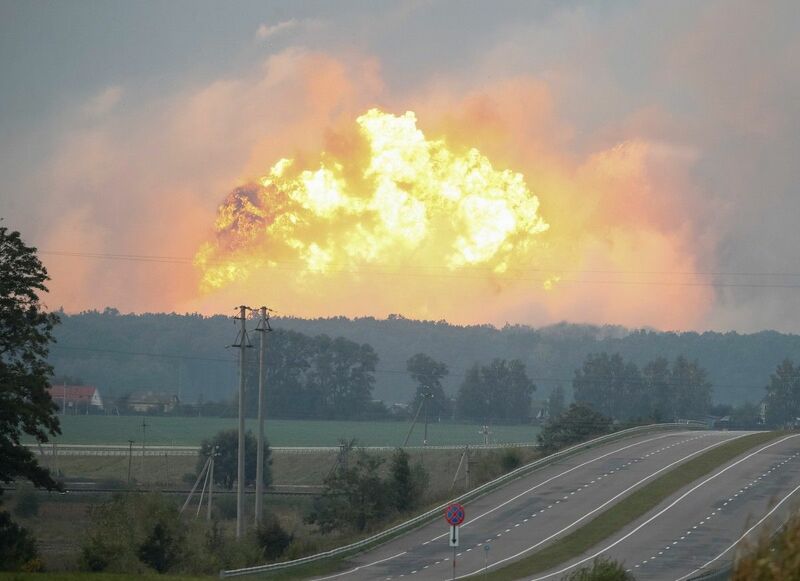 Read alsoOne of Ukraine's largest ammunition depots on fire, blasts reported – local authorities (Photos, video)The explosions and fire in both Kalynivka and Balakliya occurred late at night and thousands of people had to be evacuated from the surrounding areas.